So I am going to do something that I have never done before – actually plan my sewing projects out beforehand in order to get the most wear and use out of what I sew. Here is my spring inspiration board. I am not going to try and copy these items, they are just the springboard for what I am going for. 1 – Chambray Blazer – I just finished cutting out the fabric, so I will hopefully have something to show you soon. 2 – A Flowy Midi Skirt – I have been seeing these everywhere and love the flirty, summer feel to them. 3 – A Printed Summer Scarf – I really want to try my hand at fabric printing and I think this will be the perfect project for this. 4 – Easy To Wear Blouse – I am a mom, so I end up wearing skinny jeans and a shirt most days. I am always wishing that I had more easy to wear tops that are trendy, but still not uncomforable. 5 – Bathing Suit – I made my first two last summer and loved it. I can’t wait to try it again and I am hoping to be able to do something like this awesome version from Anthropologie. 6 – A Lace Top – I love the vintage romance to lace, but wearing it in a top makes it so much more wearable and casual for me. Have you seen Grainline’s version? I can’t wait to try my own. Can I made 6 garments in the three months of spring? Do you plan out your sewing projects? And if so does it help you? Wow Kelli, can’t wait to see it all, especially the swimsuit! I’ve got some swimsuit fabric I’m wanting to use but have no idea where to start in terms of looking for a pattern, so it will be great to get some inspiration from yours. I like these ideas, I’m interested in where you are going to get the fabric for the lace top. I always have at least 5 things I want to sew and have trouble going in any one direction. I have, from time to time, written them out but never could commit to finishing the list… I always move onto something else or re-appropriate fabric for another project. So planning is futile. This is the perfect way to break down this ininomatfro. Wow, great choices! I am CRAZY about the skirt and the lace top – can’t wait to see them! thanks amanda. i hope they turn out! Heck yes, we have so many similar ‘to sew’ inspiration items! I love that green top a ton and agree with the jeans and a top uniform. Though I am not a mom it’s hard to get all fancy just to work for yourself all day. I can’t wait to see your bathing suits, that is a seriously exciting project! Also you can totally make 6 items in 3 months, just 2 a month and you’re good to go. You’ve got the skills! I reckon you could get through this list with ease. I’m loving the idea of a lace blouse. Oh man! I’m all about making plans – was kind of slow to it at first but I think it keeps me on track and stops me from getting distracted by all the pretty stuff I’d like to sew! This is a great list – I’m with you 100% on the chiffon skirt – I’m actually making mine tonight! And please please let me know if you find an awesome, easy throw on top pattern, I’m always on the lookout. Your plans are so inspiring! The fabric printing and swimsuit?! Can’t wait to hear all about it. That Chambray blazer!!!!! I love it! I was just telling my friend, while shopping a few weeks ago, that I must sew a blazer this year. Of course, she bought herself a wonderfully trendy champagne colored blazer at H&M that day. But…oh…I REALLY like the Chambray blazer. 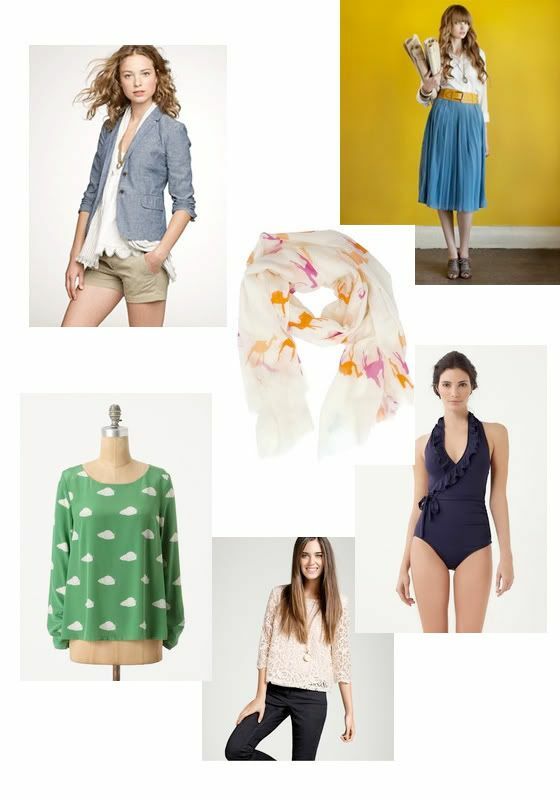 Your spring inspiration is great, and with some careful planning I think you can make all 6 items! Why not? As for me, I am just getting my sewing groove back. I tend to plan but not execute too well. I need help with that!! Hi Kelli! I agree with you – I plan my sewing projects per season and that way I do get a lot of wear out of them 🙂 Of course there is the in-between items as new inspiration hits, but it is most satisfying to know that you’ve accomplished your “wardrobe plan”! I wish you all the best… I’ve been inspired by your blazer post, a jacket is on my winter sewing list (we’re heading for winter over here in South Africa!) and your post give me the last bit of inspiration needed 🙂 Thank you for sharing! You mean I don’t have to pay for expert advice like this anmeroy? !